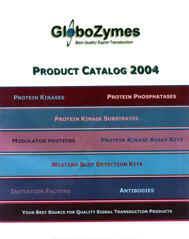 GloboZymes maintains a cell signaling, cancer and apoptosis-related research program. Our purified protein kinase, protein phosphatase, protein kinase substrate, modulator protein, protein synthesis initiation factor and affinity-purified antibody preparations generally exhibit greater than 90% homogeneity as judged by SDS-PAGE. Our antibodies are effective for the detection of some of the rarest protein kinases, protein phosphatases, modulator proteins and initiation factors. Our products are distributed worldwide. There are no products available from this supplier at this time.